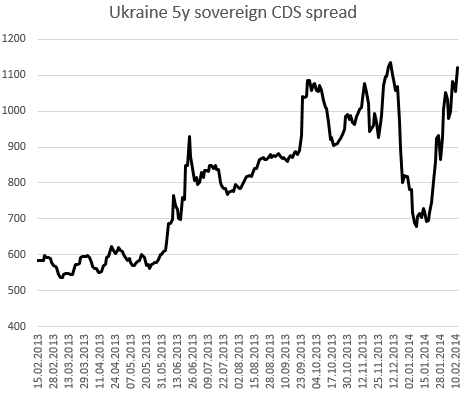 Ukraine's sovereign CDS spread is approaching the high reached right before the Russian bailout was announced. The currency is nearing the pre-bail-out lows. The market is all but discounting the nation's ability to obtain the next batch of bailout funds - wherever it comes from - before defaulting. Euronews: - Financial experts have warned Ukraine is on the brink of default with some saying currency reserves are enough for only two months. Russia has provided the first three billion dollar tranche of a loan. With the political stand off the rest has been frozen. There are no easy answers here, as the nation faces a daunting challenge of obtaining cash to run its government for the next few months. Many view the country as a victim of tensions between the West - who prefers to see a certain type of government there - and Russia, who is not too interested in Ukrainian sovereignty. Some analysts warn that Russia could escalate its pressure on the former Soviet republic. WSJ (Stephen Blank): - Behind its coercive diplomacy in Ukraine is the threat of force, either incited by Russia or carried out by it. Recent reports of pro-government militant groups forming in eastern Ukraine, calls in the Crimean legislature for Russia to "rescue" them from Ukraine's anti-government uprising, and repeated discussions in the Russian media about partitioning Ukraine, all point to a pattern of escalating pressure from Moscow—a pattern that paves the way for the use of force. In the mean time, the tensions on the streets are rising, as both sides - the protesters and the authorities - harden their stance (see story). Time is running out for Ukraine.